EDM Department is located in the Chicago suburb of Bartlett, Ill., and serves customers in the aerospace, defense-communications, telecommunications and medical industries. The company handles research and development, production and turnkey solutions, all under one roof. It was increasingly finding itself needing capability for miniaturized part production and mold development. It wanted to expand its micromachining capabilities to accurately measure and inspect microcomponents, to further enhance its part quality. What was needed was a solution that would get the company closer to the 1-micron scale. EDM Department purchased a Makino EDAC1 Ram EDM machine to help it gain micromachining capabilities. It also purchased the Infinite Focus optical 3-D metrology system, which generates high-resolution, repeatable and traceable results by allowing users to see surface finishes in high detail. 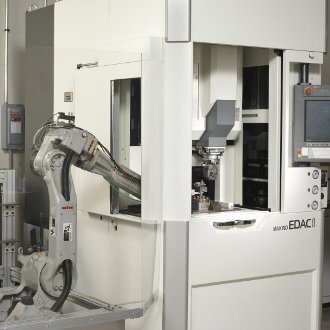 When it initially tested the EDAC1, EDM Department found that the machine was two to three times more capable than what the company could have expected. The increased accuracy and stability has allowed the company to experience tighter microtolerances and improved micromachining process capabilities, compared to previous machines. The EDAC1 regularly achieves 1.7-micron tolerances and is capable of producing corner radii of 0.00019 inches (0.005mm), with surface-finish quality of 0.000024 inches (0.6 micron) Ry, while providing repeatability in the submicron range. It also achieves positional pitch accuracies of ±0.00004 inches (1.0 micron). EDM Department has also benefited from significant cost saving with the EDAC1, because of the impressive repeatability that it provides. In fact, EDM Department’s return on investment is exceeding expectations on the development side by approximately 50 percent. Since adding the metrology solution, EDM Department can model electrodes before burning them and measure cutters before cutting them. This allows the company to further minimize micromachining lead-times, speeding up the iterative process from days to hours in some applications. With the EDAC1 and Infinite Focus, EDM Department is seeing a 7 percent improvement in surface finishes in its miniaturized part production. The new micromachining production capabilities afforded by the EDAC1 and Infinite Focus have opened the door for several new job opportunities at EDM Department.